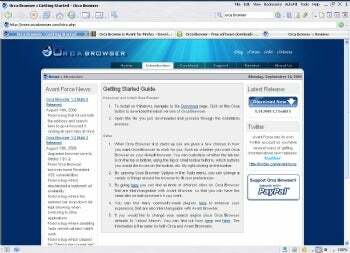 The free Orca Browser for Windows starts with the Firefox browser and builds in some extra features, such as bookmarks sync or ad blocking, that you normally only get with add-ons. But using it means putting up with some major limitations with searches, add-ons, and other features compared with Firefox. Firefox-based Orca Browser is like Firefox with many add-ons already installed...but the Firefox add-ons may work better. Orca's extra features include online storage that can be used to synchronize bookmarks and passwords, an ad blocker, an RSS reader and other options. Bookmarks synchronization is one feature in particular that nobody should be without, but it's also something you can get for Firefox with an add-on like Xmarks. Other Orca features can likewise be gained with other Firefox add-ons. And in some cases, the Firefox add-on might work better. For example, after enabling the built-in Orca ad-blocker, I still saw many ads. Viewing the same page with Firefox and Adblock Plus didn't show them. Although vendor Avant Force provides a list of additional Firefox extensions you can install into Orca, some popular add-ons-- including McAfee SiteAdvisor and Locationbar2--don't work at all. Also, while Orca offers the ability to switch between some built-in skins on the fly, you can't use Firefox themes. Finally, Orca makes it hard to change your search engine. Instead of the drop-down menu in Firefox that lets you quickly choose a different engine, in Orca you have to dig into the program options to choose something other than Yahoo. The only other listed options are Google and Avant find (from its creators), and although you can manually type in the search string to use another engine, you can't use the simple search plugins available for Firefox on many sites. If you're allergic to installing your own add-ons in Firefox, then Orca's built-in extras will provide some welcome new features. But anyone willing to find and install a few add-ons into Firefox will likely end up happier.